There’s a saying in Scotland that goes something like this: if you don’t like the weather, just wait five minutes. 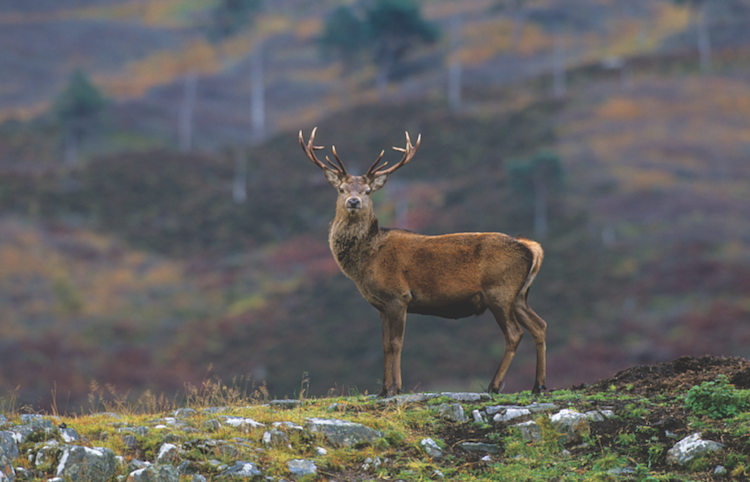 We experienced this first hand on a recent visit to a local strath, where the changing elements made us feel like we had a yearlong tour in just one day! Starting the morning in a light drizzle, we left Aigas and quickly transitioned into a torrential pour. 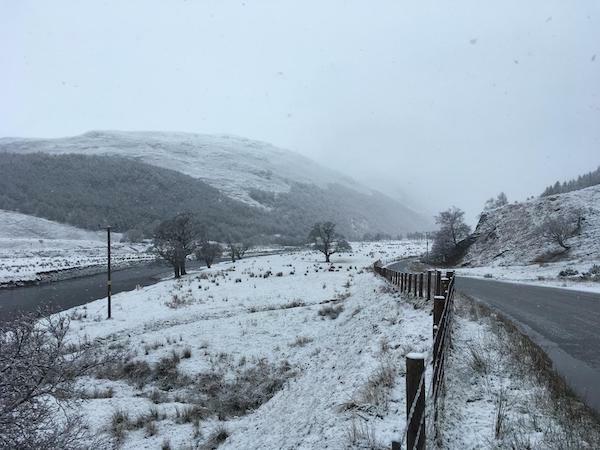 As we wound our way through the glens we stepped into a second winter, as snow began to coat the vehicle and freshly ploughed fields gave way to icy hills. As the snow grew thicker and the mists turned to fog, we were forced to abandon our usual plan of watching the skies for golden eagles; it’s hard to see birds flying in a sky that is no longer visible. Instead we travelled further down the strath, watching for red deer that would be forced down from the hills by the poor weather conditions. We turned around to leave for our next location and were rewarded with a sudden shock of clear sky, allowing us to soak in the incredible landscape around us. 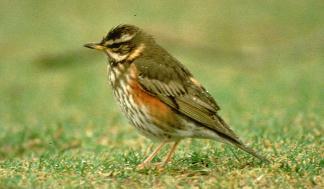 During this time we spotted a small flock of redwing, soon to be migrating northwards to Scandinavia where they spend their summers. Leaving the redwing in their winter hills we headed to our next location, the skies steadily clearing and the snow vanishing as quickly as it came. We spotted one harbinger of spring everywhere we went – newborn lambs! We saw a pregnant ewe, clearly about to give birth; returning the same way less than 15 minutes later we saw the just-born lamb, already on its feet! Finding a lochan, we took a stroll, witnessing more animals preparing for spring. A mute swan sat constructing her nest, heaping large amounts of sticks and reed stems into a formidable pile to be used while incubating her young. Nearby, two pairs of Slavonian grebes – 5% of the total UK population – were performing an elaborate courtship dance known as a ‘discovery ceremony’ – the first of four distinct pair bonding routines. We watched as each partner performed a penguin dance, swimming around each other with an upright posture and erect crest. This part of the pair bonding process allows the individuals to determine whether their partner is a suitable mate for the season to come. Winding our way home we entered a (brief) window of blazing, summery sunshine; a stark contrast to the frosty fields earlier in the day! 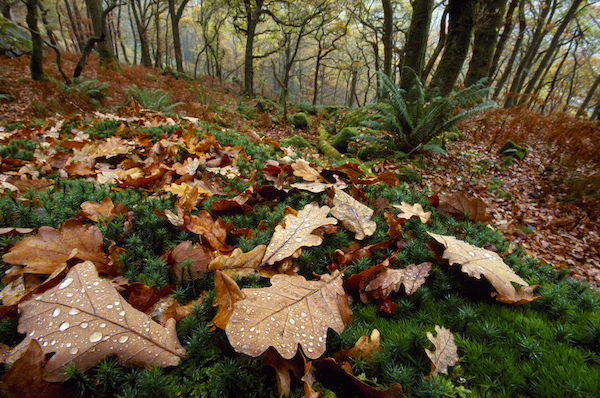 Passing through an area of oak woodland, we noticed brown tannin-filled leaves still on the branches since last autumn. At the end of the day we felt like we’d been gone a year; experiencing spring, summer, autumn and winter in only a few hours. If you’d be interested in seeing some of these amazing sights, why not book onto one of our Walking and Wildlife courses?